You can share a route with customers by email. Suppose you have several customers on one route and a customer wants to know about the shape of the route and what the delivery schedule looks like. 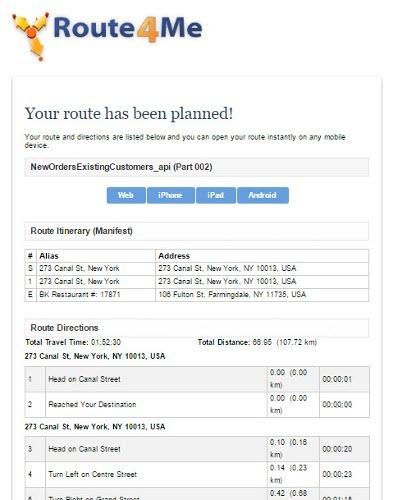 With the Route4Me API, you can share the route with them directly via email. 13 curl -o file1.txt -g -X POST -k -d "@new_orders_existing_customer_optimization_data.json" "%URL%?api_key=%apikey%&route_path_output=%route_path_output%"
You can expect an Optimization Problem (see link), which has generated two routes already. Let's choose the second route - which is longer and more complicated and therefore more likely to inspire inquiries from curious customers. In the RESPONSE you can see the array of the fields path_to_next and use them to draw a route on a map, exactly as it is generated by the Route4Me API. Now you can send information about the route to several customers. Pay attention to the parameter recipient_email, which is where you can put a comma delimited list of e-mail addresses for the recipients. 13 curl -o file1.txt -g -X POST -k -H "Content-Type: multipart/form-data;" -F "recipient_email=%emails%" "%url%?api_key=%apikey%&route_id=%routeid%&response_format=%response_format%"
By clicking on this button, a recipient can start to edit the route on Route4Me's official website. In fact, anyone who's reading this article can also press the button and start editing (as long as you're a registered user of Route4Me's web app, that is). Check it out!